For the S&P 500 Index, last week's story was a combination of resistance at the 200-day Moving Average making it unusually sensitive to any negative fundamental news and that arrived Thursday on a report of declining German exports, resulting in a revised lower Eurozone growth forecast. The combination created a gap lower opening that ended the short-term uptrend from the December 26 low, thereby increasing the chances for a meaningful retest of the low. Accordingly, a detailed collar suggestion for SPY using Advanced Options data follows a short market review. S&P 500 Index (SPX ) 2707.88 added 1.35 points or +.05% last week, including Friday's reversal day closing 1.83 points or +.07% higher. Last week could have been labeled "Target 200" as resistance at the 200-day Moving Average became an ideal place for profit taking. Now look for support from the operative downward sloping trendline from the October 3 high around 2650. 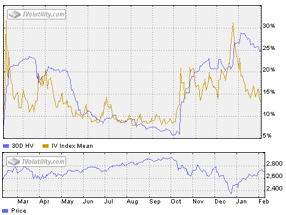 CBOE Volatility Index® (VIX) 15.72 6 declined .42 points or -2.60% last week. Our similar IVolatility Implied Volatility Index Mean, IVXM using four at-the-money options for each expiration period along with our proprietary technique that includes the delta and vega of each option, declined .25 points or -1.89% ending at 12.99, below the bottom of the recent range shown in the one-year volatility chart and the SPX line chart. With 2 trading days until February expiration, the day-weighted premium between February and March allocated 10% to February and 90% to March for an 8.26% premium vs. 7.54% the previous week ending February 1. Well below the bottom of the green zone between 10% to 20%, it continues suggesting cautionary positioning unconvinced the SPX advance will continue without an attempt to retest the December lows that may have just begun.